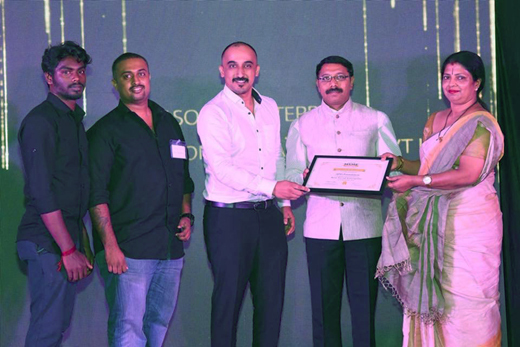 Mangaluru, November 7, 2018: City Based APD Foundation has been conferred with the ‘MSME Best Social Enterprise Award 2018’ during NITTE-KBL Conclave and Business Excellence Awards - 2018’, a programme jointly organized by K S Hegde Institute of Management, Nitte and Karnataka Bank Limited, at Hotel Ocean Pearl, Mangalore on Saturday, November 3. MSME (Micro, Small and Medium Enterprise) Awards are a platform to acknowledge, recognize, inspire and reward the MSMEs that have showcased the potential to be world class enterprises, according to the programme organizers. It selects the most distinguished achievers from among the state’s MSME enterprises to recognise and honour their outstanding contribution to society. APDF team lead by Founder-Chief Abdullah A. Rehman and comprising Karl D’Cunha and Dhanush Desai received the award from Mr. Ramakrishna Achar, Managing Director of SKF Boilers and Dr. Ashalatha from Nitte University. APD Foundation received the Award under the category ‘Best Social Enterprise’ for its various pioneering interventions in improving the solid waste management profile in the city. “We are grateful to NITTE-KBL for recognizing the efforts of a small organization like ours along with many other much larger organizations. This is truly uplifting and motivates us to increase our commitment to strive for public health and welfare,” said an excited Abdullah A. Rehman. Anti Pollution Drive (APD) Foundation is a nonprofit organization that works towards mitigating air pollution, facilitating sanitation of the environment and thereby help improve public health and the economic profile of Indian cities. Since 2016 APDF has partnered with Manglauru City Corporation and Antony Waste Handling Cell for organizing continuous and sustained IEC campaigns on solid waste management for Mangaluru city. On an average 15-20 such outreach programmes are held each month. APD has also conducted ‘Shudda Gaali’, the city’s first Air Quality Assessment and Health Impact Assessment and an aggressive campaign against smoke emitting vehicles. In order to reduce the waste from reaching the landfills APDF has driven various on ground activities and used technology by proving solutions through a one-of-its-kind ready reference website recycleindia.org. APDF has also developed 10 toolkits for waste generators to learn on how to achieve zero waste lifestyle. In the past three years since its inception APD Foundation has successfully completed about 25 projects for Mangaluru city. APDF has earlier been recognized prestigious awards like UN-Habitat & NSF, Mumbai (2015), Karnataka State Pollution Control Board (KSPCB), Mangalore (2016) and Skoch Order of Merit, New Delhi (2018).